If the following was "Public", it allowed the follower's picture to be displayed in the gadget, which was linked to the follower's profile. 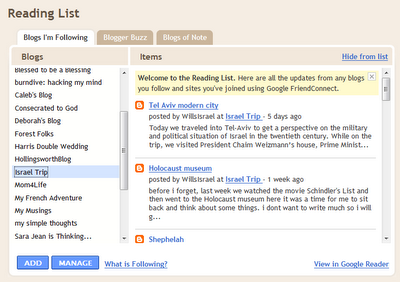 It added the blog to the "Reading List" in the follower's Blogger Dashboard. It automatically added a subscription the blog in the follower's Google Reader. The first thing i noticed was that now it was bigger--and as a result mine looked so very empty. 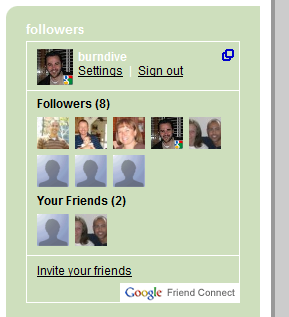 My only followers in this screen shot are myself and my mother: it's both so sad and so endearing. Thanks for your support, Mom! 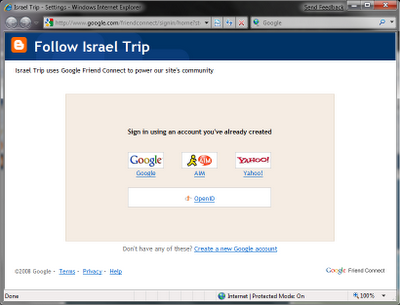 You can sign in to Friend Connect using either your Google/Blogger account, or another account, such as AIM, Yahoo, or even OpenID: Friend Connect will automatically import your list of friends/buddies/people you follow from the network that you use to sign in. 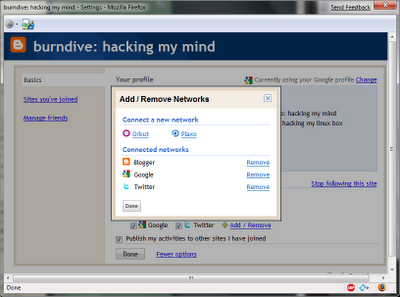 You can also add accounts from certain other networks to make them visible as well. As you can see in the above image, the selection of networks isn't all that great yet, but I imagine eventually they'll have support for the likes of Facebook and Myspace, as well as MSN (Live). Currently, I imagine, Facebook wants this to fail in its infancy, because they want to be the only social hub in town and would rather this be a Facebook widget, but I think if it catches on, they'll be forced to come around. 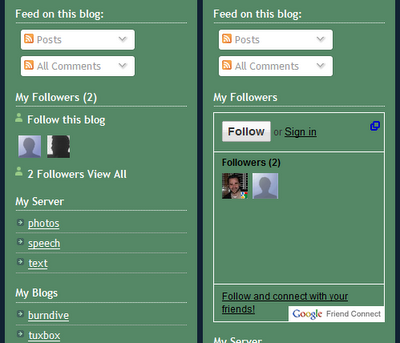 Within the Friend Connect box you can look at other followers, their profiles, links, and blogs, as well as what other blogs they're following. The whole idea of Friend Connect is that if another user is your friend on a social network that you (and that other friend) tell Friend Connect about, they show up as your friend in Friend Connect. Below, you can see that my mom and sister are also following this blog, and since they are on my Google Talk list, Friend Connect recognizes them as my friends. When you click on someone's image, you can view their information, and have the option to add them as a friend directly through Friend Connect. If I have this feature enabled on a blog, and I post a comment on that blog, the comment would show up on my Orkut profile (or whatever other social networks I'm on that support Friend Connect). I don't have an Orkut profile, so I can't be sure that's how it works, but that seems to be the gist. While Friend Connect can be added to any web site (I think), I'm only able to "Follow" blogs that are Blogger blogs (blog blog blog). So, Deborah, the latest post I can see of yours on your Blogger blog is "Married", which is quite some time ago. I know it's possible to make friends-only Blogger blog, (and those show up just fine), I don't think it's possible to make individual posts private. THEREFORE, I must conclude that you're referring to your LiveJournal blog, for which this feature is not available. The only way that I can see your private LiveJournal posts is to log in to LiveJournal (with OpenID) and read them there. I don't remember to do that very often. I wish there were a way to use an RSS feed (with hashed login data or something) so they would show up in Google Reader like your public posts do, but alas, that is not the case. Yeah, I was referring to LJ. 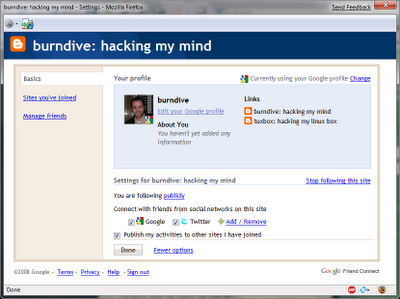 It's really too bad that it doesn't allow for there to be a feed if it recognises you somehow as logged in. You miss out on all sorts of interesting stuff! I don't know though, I don't really feel like I need to use the friend connect feature, because I put all of my friends into Google Reader, with every single other blog that I read. That's a lot easier, because it compiles all my blogs (except LJ, of course) that are all different "brands". Yeah, I use Google Reader for reading the blogs too, and "following" a blog with your Google account ads it to Google Reader automatically. I just think it's a cool feature, and has great potential if it actually catches on.